Nowadays, it has become mandatory for compliance teams to think about regulation in a holistic way, and to find improved methods of managing the vast amount of transactional data being collected each day. Organisations must comply with Anti-Money Laundering (AML) rules, with the main purpose of detecting and reporting suspicious activity. This is effectively achieved through the use of an AML transaction monitoring solution. By monitoring and analysing cash deposits, withdrawals, and wire transfers – AML transaction monitoring software can provide the compliance team with a complete view into a customer’s profile, risk levels, and predicted future activity. There is a growing focus on monitoring every transaction, which leads to the importance of adopting a broad-based approach towards dealing with business risk. Organisations need to be able to identify potentially unusual financial transactions which might subsequently prove to be suspicious within the context of existing anti-money laundering regulations. The mapping of these data points is critical for a full picture of the client’s profile, their commercial activities, private wealth distribution, and management structure. Although many organisations have implemented robust and costly Know Your Customer (KYC) solutions, the problem often remains in the identification of suspicious transactions. This tends to involve submitting large amounts of alerts, many of which are false positives, without any form of analysis. Consequently, compliance teams are flooded with information which reveals very little intelligence. 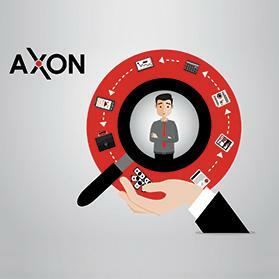 The AXON transaction monitoring solution helps organisations to detect suspicious behaviour quickly and effectively. It optimises transaction monitoring by automating processes in order to minimise unnecessary alerts, while also offering real-time tracking and reporting functionality. With AXON, compliance teams become more accurate and efficient in their monitoring of potentially fraud-ulent behaviour. Visit www.computimesoftware.com or e-mail info@computimesoftware.com to learn more about AXON and how it can help your business achieve AML compliance.